After living abroad for many years, American-born Sarah Muller (Bette Davis) and her family return to USA. Sarah’s German husband, Kurt (Paul Lukas, Dodsworth), who has been fighting fascism in Europe, is particularly looking forward to a nice rest. However, the Mullers’ happiness is short-lived; they unexpectedly discover fascism in USA. Film adaptation of Lillian Hellman’s political stage play, adapted by her then lover Dashiell Hammett, perfectly embodies a specific time in American history. Watch on the Rhine is an interesting time capsule, but there are very good reasons why it has never been considered a Hollywood classic. The original stage production preceded the attack on Pearl Harbor by eight months so in that respect you can say that Hellman’s warning about the long tentacles of fascism was prophetic. The movie was released at the height of World War II and I could only imagine people’s reactions to such a heartfelt story about topical issues. In my opinion, that’s precisely the film’s main problem — endless speeches about personal responsibility and the evils of fascism today make the movie heavy in the palate. Casablanca (1943), which was released around the same time and deals with the same issues, remains fresh and exciting while Watch on the Rhine is a bit stale. 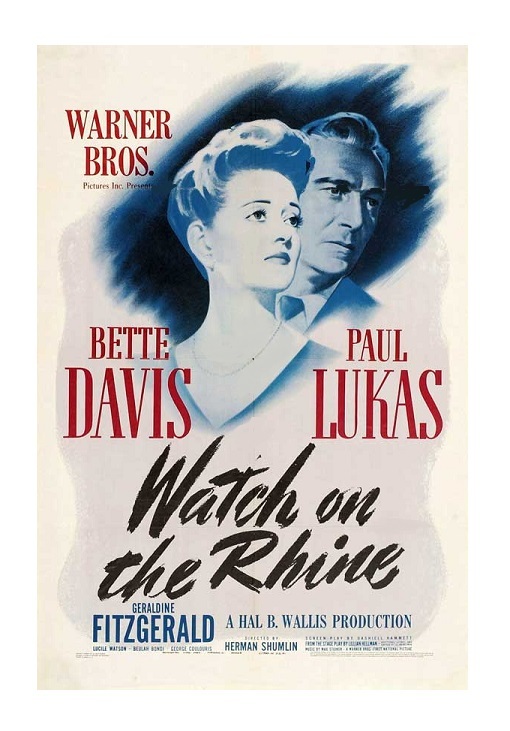 Maybe comparing the two movies is not fair, but we have to remember that Watch on the Rhine was considered the better of the two movies. 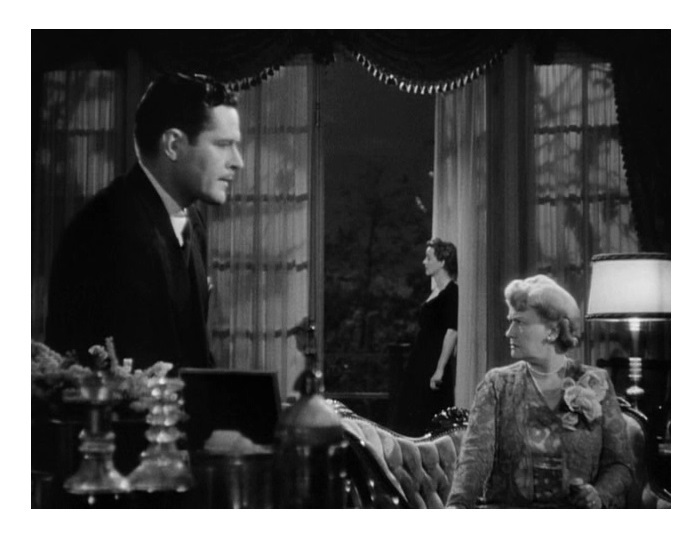 Casablanca‘s Best Picture Oscar was a surprise; the smart money was on Watch on the Rhine (the movie did win the New York Film Critics Circle’s top award). Besides its intellectual heaviness, the film has another huge problem. The movie was shot in a rather unexciting manner by first-time director Herman Shumlin. He doesn’t have the fundamental understanding of film technique. He has two kinds of shots; close-ups and medium shots. And he never cuts into a speech. I wished someone like Michael Cutiz (The Adventures of Robin Hood and Mildred Pierce) would have directed the movie (cameraman Hal Mohr allegedly directed part of the movie). 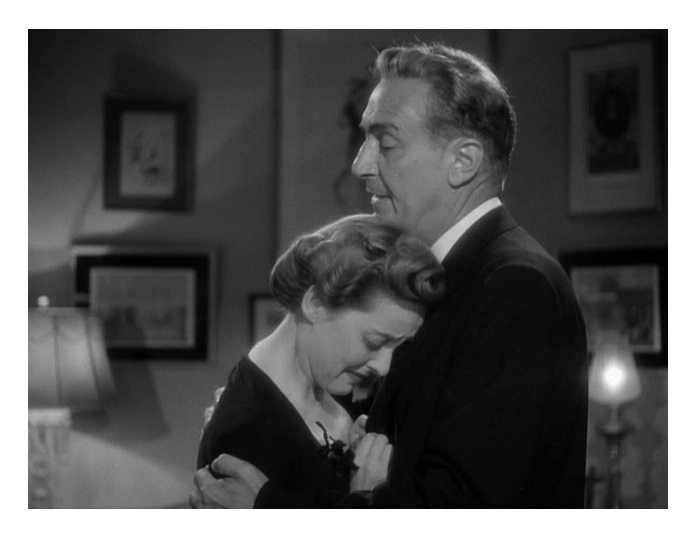 Bette Davis is merely okay in the secondary role of the wife. The problem is that Sarah is a reactionary role. She’s a sounding board for Kurt’s conflicts. Although the story takes place in Sarah’s household, this is Kurt’s story. Davis’s screen persona is at odds with her character’s function in the story. In other words, Watch on the Rhine can never fully recover from Davis’s grotesque miscasting. 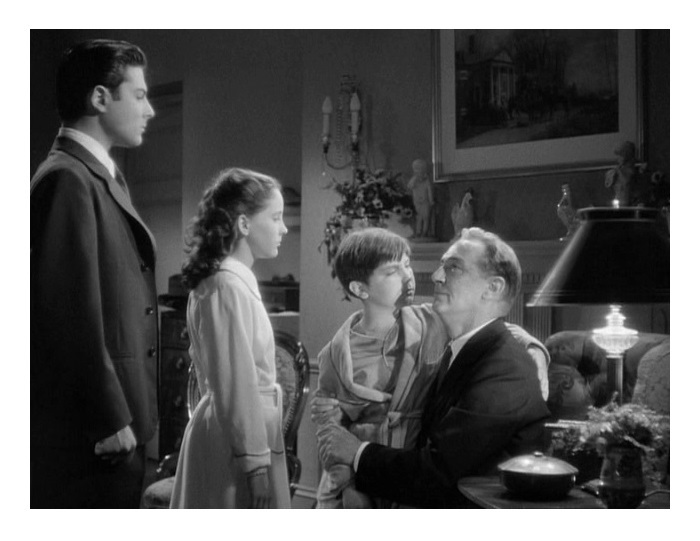 On the other hand, Paul Lukas is superb. He won the Oscar against some stiff competition and while I don’t think he was the best of the five nominees (Humphrey Bogart’s Rick Blaine and Gary Copper’s Robert Jordan were better), I’m fine with his trophy. Lukas makes the most of a once-in-a-lifetime-opportunity. He never again had the opportunity to shine so brightly. After his triumph at the Oscars, Lukas resumed his career as a wonderful character actor in many films (I’m particularly fond of him in Disney’s 20,000 Leagues Under the Sea). This fine Hungarian actor died in 1971. The talented cast also includes Geraldine Fitzgerald (Dark Victory) as Marthe de Brancovis, George Coulouris (All This, and Heaven Too) as Teck de Brancovis, Beulah Bondi (It’s A Wonderful Life) as Anise, and Henry Daniell (The Private Lives of Elizabeth and Essex) as Phili Von Ramme. Lucile Watson (The Great Lie), who plays Davis’s mother, received an Oscar nomination for Best Supporting Actress. Watch on the Rhine hasn’t aged well. I liked Hellman’s dialogue (“we’ve been shaken out of the magnolias”) and most of the performances are excellent. The film managed to capture a moment in time, but the movie itself was made in a rather lazy manner. Thankfully, Lukas is so good that I believe he alone makes the entire movie watchable. B&W, 114 minutes, Not Rated.